SALEM, Mass. - My father believed Halloween was a stay-at-home holiday. He armed his children with pillowcases for candy and Dial soap for the windows of darkened houses. Of course, he never visited Salem. New England in general is bewitching this time of year - the color of the leaves, the crispness of the air - but in this seaport, sorcery and the sad lessons of history are on display, always. More than 300 years ago, 19 people were hanged and another pressed to death after being unfairly convicted of practicing witchcraft. Today, the occult is to Salem what snow is to Utah, and October is the most wonderful time of the year. They celebrate Halloween here, not harvest festivals, and they do it all month long - through seances, psychic fairs, ghost hunts and Hitchcock festivals. Salem is spooky and kooky, mysterious and ooky, thanks in part to its painful past, but also to modern-day witches who have come out of the shadows to defy stereotypes and design marketing brochures. Salem - on the coast, 16 miles north of Boston - was home to America's first millionaires, men whose fortunes were tied to the sea. The legacy of their wealth can be experienced on a walking tour known as the Heritage Trail, highlights of which include The House of Seven Gables, the oldest surviving wood mansion and inspiration for Nathaniel Hawthorne's book; a reconstructed 1797 merchant ship called Friendship, anchored at Derby Wharf; and the country's oldest continuously operated museum, The Peabody Essex Museum. Although the museum's 1799 charter required members to collect "natural and artificial curiosities" from beyond the Cape of Good Hope, curators did not have to look that far for one of its most fascinating oddities: original court records from the 1692 Salem Witchcraft Trials. The Phillips Library at the museum keeps a rotating display of the dense, cursive scripts, which document a tragic episode in our nation's history. The witchcraft crisis began a few miles from here in Danvers (known then as Salem Village), where two little girls living in the home of a minister began to suffer fits that their elders attributed to witchcraft. In the following months, nearly two dozen accusers would claim to be tortured by the apparitions of witches, resulting in legal action against 144 people. Imprisoned for long periods of time, many simply confessed and were stripped of their property and dignity. Those who held fast to their innocence - 15 women and five men - were executed. Their memories are immortalized in stone monuments - one for each victim - adjacent to the Old Burying Point Cemetery, where the "hanging" judge, John Hathorne, is buried. The day we visited the memorial, people had left flowers, apples, notes of regret and a voodoo doll. It took three centuries for the people of Salem to erect a permanent memorial to the accused, though entrepreneurs and city leaders have been capitalizing on their plight for years. Salem, with a population of approximately 45,000, has plenty of tarot-card readers, spell casters and spirit summoners, and, souvenir-wise, more witch kitsch than you can shake a broomstick at. Police cars sport "witch" labels, as do Salem High School athletic teams. There's even a bronze statue of Elizabeth Montgomery, of "Bewitched" fame, in Lappin Park. As for attractions, I counted five witch-themed museums within walking distance of the memorial, most of which consist of tour guides telling the story of the trials while tourists stare at dioramas. Most of these places struck me as hokey, mere fronts for gift shops, though the majority of visitors seemed to think the experience was worth the $5 to $10 admission, especially the kids. In my youth, I was scared silly by a soap opera ("Dark Shadows'') and was under the spell of one Wilhelmina Witchiepoo (of "H.R. Pufnstuf"), who terrorized a boy and his annoying magic flute. I drank pickle juice and pretended it was a magic potion that gave me powers. I begged for candy well into my teens. As an adult, Halloween has lost its thrill. Trick-or-treaters have done a disappearing act, and those who do participate tend to dress up as Barbie, not Barnabus. Corn mazes have replaced spook alleys. Even horror movies have lost their appeal. That is why, at the risk of conjuring up my dad's ghost, I'll be coming back to Salem and encouraging others to do the same. 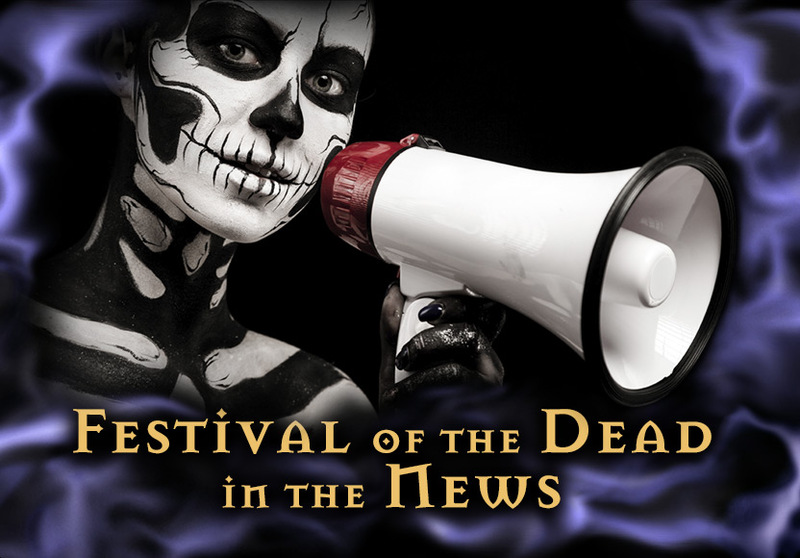 And first on my to-do list is the Festival of the Dead. Christian Day is a practicing psychic, former ad executive and co-founder of the 5-year-old festival. Before 2003, says Day, "Halloween in Salem was all corn husks and dog shows and kiddie costume contests." The goal of the festival is to help visitors explore death from a scary, sacred, spiritual, historical and playful perspective, and Day dresses the part. Each autumn, Day, who describes himself as the Howard Stern of witchcraft, trades the T-shirts and Tevas of summer for a more menacing wardrobe, lurking around town in leather pants, knee-high boots, black hat and spell cape. He teaches a clinic on necromancy, the art of conjuring up shades of the dead to do your bidding, and promotes two masquerade balls, including a bawdy tribute to vampires. His personal favorite is The Dumb Supper, a three-hour banquet during which people eat and reflect in total silence about lost loved ones. Diners bring pictures, drawings and poetry and place them on the Altar of the Dead. And there is music - everything from bagpipes to Catholic hymns to Luther Vandross singing "Dance With My Father." Most people are in tears by dessert, Day says. "More than 500,000 people come through this city in October, and we want to help them understand death better." Learning from history has been somewhat harder. Representatives of Repent America, a born-again group that urges intolerance of non-Christians, gays, hate-crime legislation and abortion, is planning yet another Salem pilgrimage to protest its wicked ways. And just last year, a Salem minister was expelled by his church for being too friendly to Day and other witches. The Rev. Phil Wyman invited them to debate the difference between magic and miracles. He visited witchcraft shops and was shown how to read tarot cards. Some witches sought him out for counseling, and a few even converted. But what witches saw as neighborliness, fellow evangelicans viewed as sacrilege; they accused Wyman of courting the devil. He accused them of conducting a witch hunt. Wyman did not bow to the criticism and, in fact, was a guest lecturer at this year's Festival of the Dead. Last Friday, Wyman presented "The Brimstone Chronicles," in which he explored the history and mystery of death and the afterlife. "My religion is all about a man who came back from the dead," Wyman told Day when asked to participate. "History is scarred by our fear of death, which has twisted the minds of men and women into believing and imagining their worst nightmares and utopian dreams," Day writes in a promotional blurb for Wyman's seminar. Salem, too, is scarred, and because of that, the quaint coastal town allows us to look at what frightens us, to experience it, laugh at it and, above all, not to be ruled by it.